Void Acoustics first unveiled their flagship ‘dance stack’ integrated installation system at Frankfurt’s Messe exhibition in 2012, to much fanfare. The product of many years of research and development, and the combination of several of designer Rog Mogale’s more esoteric ideas resulted in an incredibly striking ‘alien visitor’ perched atop a 2.5 metre tower of bass cabinets fronted by sharply angled metalwork. Since then systems have been sold and implemented at world-leading venues including Eden Ibiza, Monasterio Moscow, Omni Taiwan, Versus Belgium and more. Following several months of demos, discussion and collaboration over spring and summer 2013, Neuron were proud to commission and receive delivery of the first ever customised touring version of the full Incubus system, with a little something extra – our subs are home to a bespoke, one of a kind carbon fibre 21" transducer developed specifically to eke out the heaviest, tightest sub notes possible. 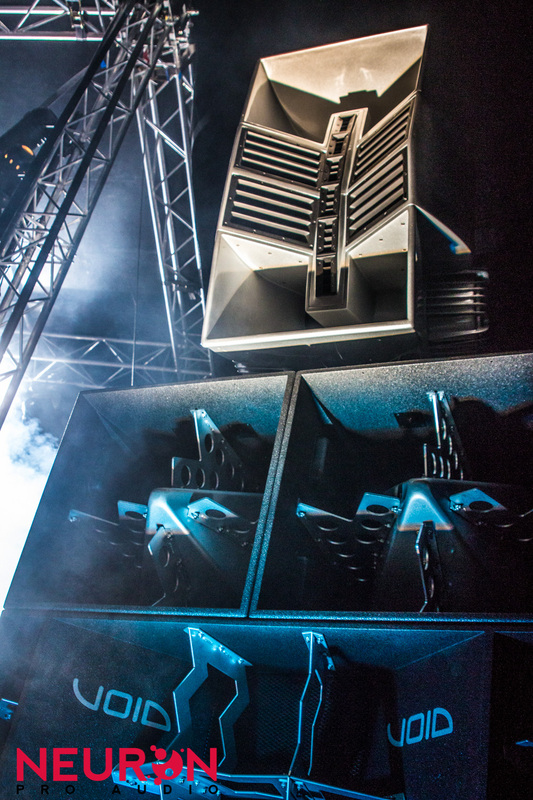 We first deployed it with great success at both Outlook and Dimensions festivals, held within the stunning Fort Punta Christo, Pula, Croatia, and are now happy to offer it for hire across the UK, Europe and beyond. The unique design not only contributes to an aggressive and menacing image; the mixture of curves across the Air Array mid-high enclosure are key in carefully controlling the dispersion pattern, and ensuring even response, whilst the metal bracing bolted through the woodwork helps to minimise the loss of sound energy through unwanted vibrations and resonance on the bottom end. All of this is absolutely vital to maintaining crystal clear, accurate and detailed sound at the phenomenal sound pressure levels afforded by this combination of cutting edge driver, loading and amplifier technology. To obtain a quote for this unique system, including all crew and transportation please call us on 0161 408 1545. Our Incubus system is available in a bespoke glossy silver finish, which allows it to be lit with colour wash lighting fixtures to take on any colour you please. Alternatively, we have strong working relationships with several visual artists who can offer bespoke 3D projection mapping services onto the stacks for an incredible visual impact at any event – please contact us for more information and pricing. As with any of our packages, we are also perfectly happy to customise the equipment to suit your needs, for example using specific DJ equipment, or adding a mixing desk and full live production. The Incubus system is equally at home with bands or experimental music, so is ideal for those situations where you want to make as strong a visual impact as the artists do with their sound.